Isn’t it crazy the pressure we put on ourselves as moms? We feel like we have to do #allthethings, #allthetime. We feel like we have to be good at everything we do. And worst of all… We are overcome by the filthy feeling of “mom guilt” if we drop any of the balls we are juggling. Society has set us up to be busy whether we work from home, work out of the home, work as a stay at home mom, or combine any of the above. As if that societal pressure isn’t enough, we hold ourselves to even higher standards and push even more towards perfection. Social media certainly plays a role in these benchmarks, yet no matter how hard we try, we can’t pull ourselves away from the grids, the new feeds and the updates. I wrote a new piece for Sleeping Baby which is FULL of the tips and tricks that I have used in the past few months to keep myself, my life, my family and my business on track and in order! And don’t worry, it’s a quick read! I know you are busy! Check it out and give a few of them a try… You’d be amazed by the power of “slowing down your yes” (thanks Rachel Hollis for that one) and asking for help! And the other 3 tips aren’t bad either. 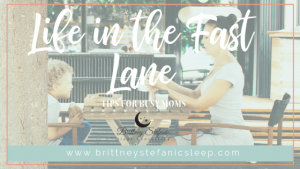 Hang in there mama — life is the fast lane can be tricky but OH SO WORTH IT and these tips for busy moms are sure to help!